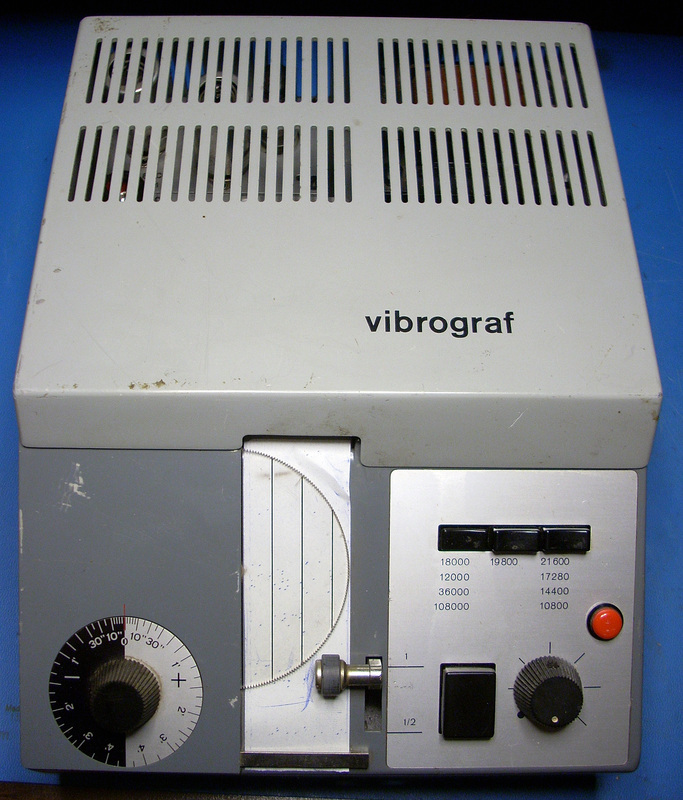 This is a tube-type timing machine but it is still a quality piece of equipment. These machines date back to the early sixties. The front panel and controls. A very straight-forward layout. 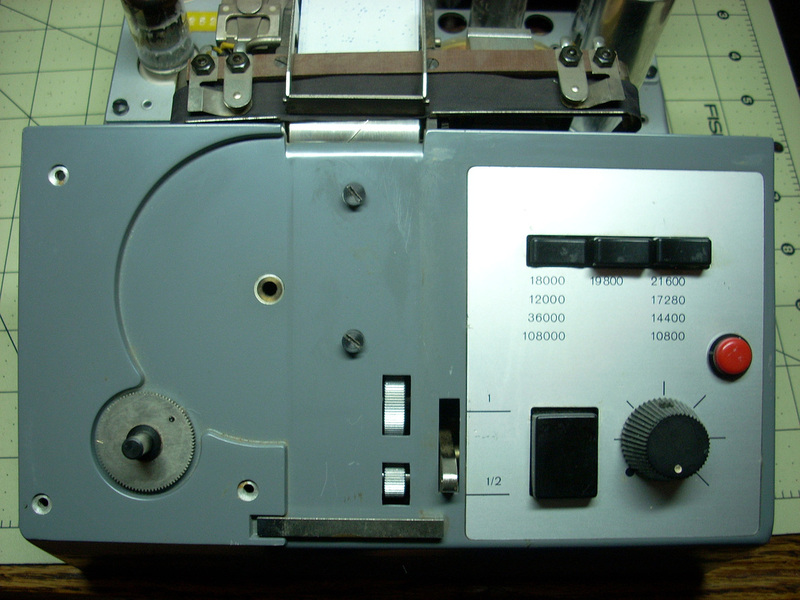 The error rate per 24 hours is read directly from the left knob scale after aligning the lines on the disc with the printed trace. The proper beat for the watch is selected by depressing one of the three push buttons. 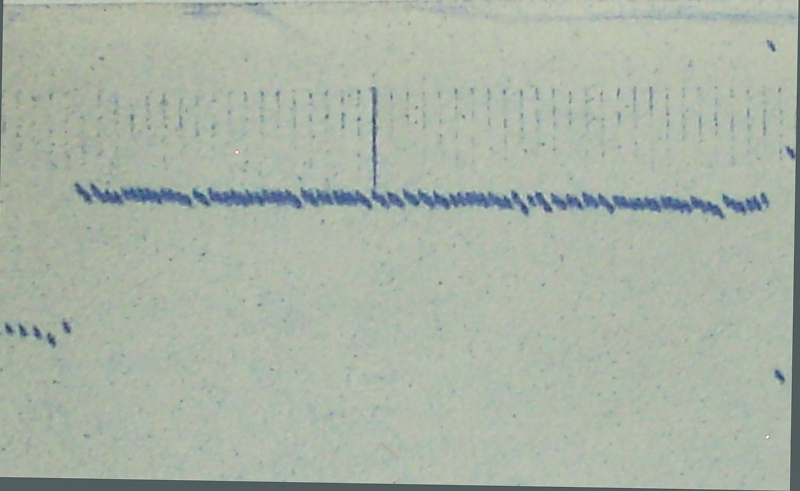 The amplitude of the signal from the watch holder is adjusted using the right knob. The printout is started and stopped by depressing the square button. Setting the roller at 1 gives a direct readout from the +/- knob scale. Setting the roller to the 1/2 position doubles the resolution. For example, in the 1/2 position an error rate of 3 seconds would read as 6 seconds. This helps in reading small errors. The red light is the power on indicator. Under the hood. I've already cleaned the unit and checked all the tubes. 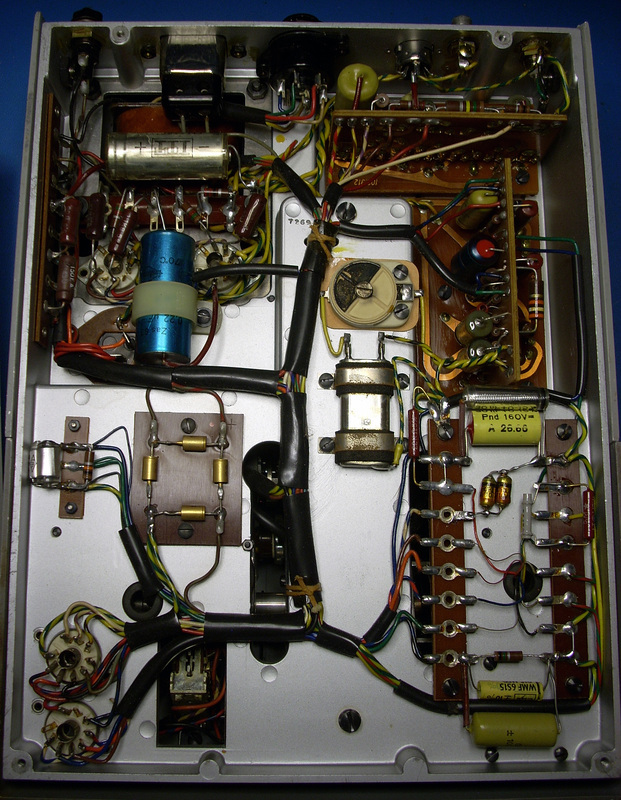 The oscillator tube on this unit has been changed from an E80CF to a GB1252 tube and the chassis relabeled - The tube pin out is the same for both. The machine can use impact sensitive paper so the ribbon is only needed for plain paper. 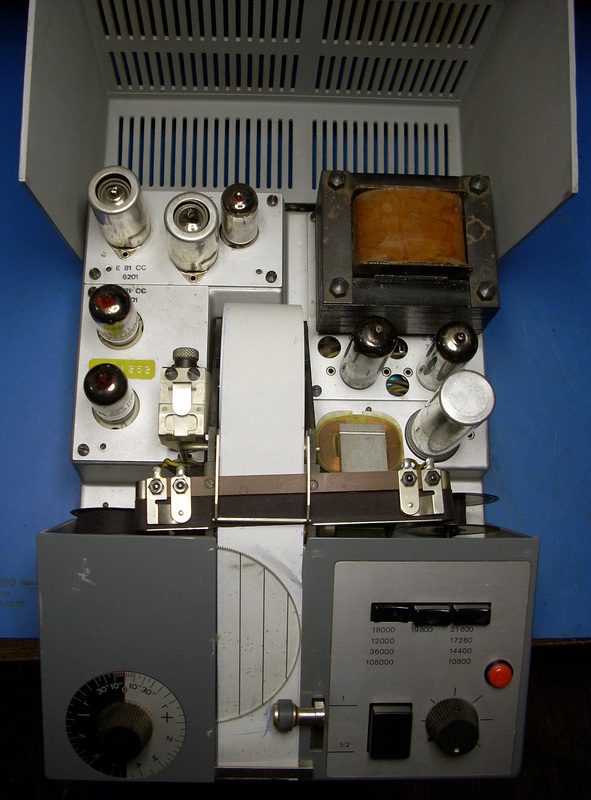 Under the chassis - on the unit pictured not much needed replaced except an electrolytic capacitor due to age. On the second B100 the tube socket for the 2D21 tube needed resoldered to the amplifier PCB because of bad solder joints. The front panel is held in place with two screws. To get at the screws the measurement disc and knob must be removed. The small panel around the knob just snaps on and can be popped off to remove disc. 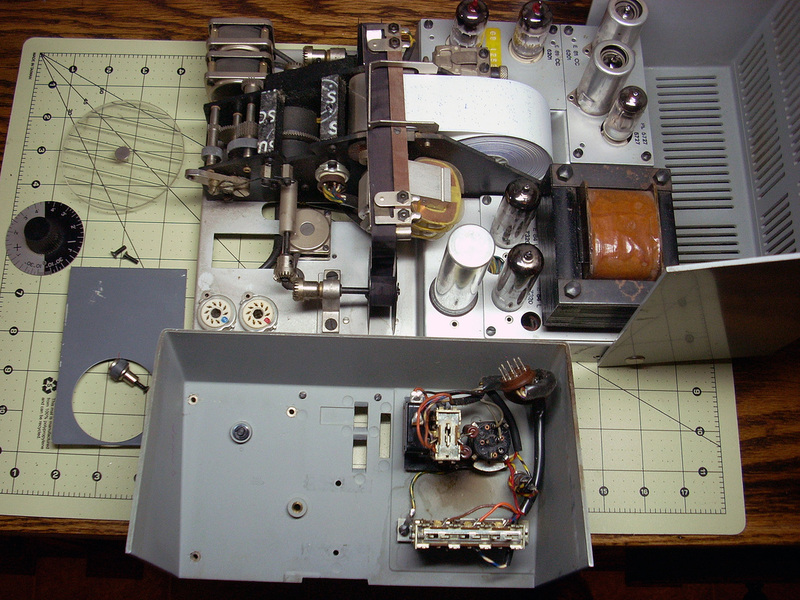 The front disassembled for cleaning. A sample printout from the B100 of an Accutron 214.